Fall has come in more ways than one this week. The trees around us on the East Coast continue to change to a rainbow of warm colors, matching the many pumpkins still remaining on picturesque Virginia porches. While the weather is great, what is even greater is the progress Andrew has made on rubble, showing off buildings falling apart in his recent livestreams! As I write this, he’s currently coding away live, explaining all the details of getting buildings to fall apart realistically. To see things in action, check out Andrew’s Twitter feed HERE. It’s some great progress on top of all the other work we have going on! Tech – WIP – Rubble: Andrew made large strides this week, as can be seen in this livestream. 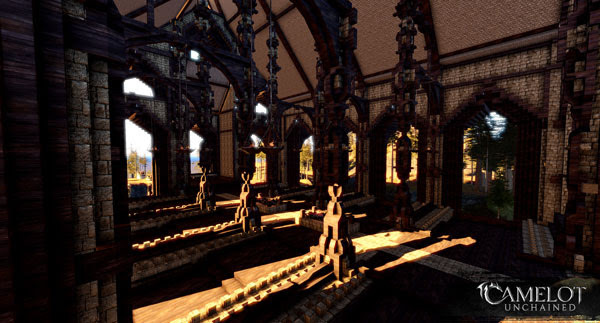 Lots of bugs have been resolved–allowing things to work plausibly now, as opposed to the “physics fun house” going on during the last two minutes of his stream. He’s hoping to have this on Hatchery next week for testing. There’s going to be more work to fully flesh this out, but this strong start gets us much closer to our epic siege battles! Tech – WIP – Readied Weapons: Ben updated designs for our kick-off meeting, making it so Christina can begin work on this! Readied Weapons will allow players to swap weapons during combat without going back and forth in their inventory. Art/Tech – Crafting UX and styling: With much of the art complete, AJ and James are now turning all that great art and styling into a real, working UI. All the cool functionality and visuals of this new UI will greatly improve the player experience! Tech – Coherent and 64Bit: Small update here to let you know that work continues on both fronts. Matt and JB continue updating the API to work with all the UI elements. Once everything is done, we’ll flip the switch and get some strenuous testing going! As mentioned last week, George was able to begin work on moving the client from 32 to 64 bit. This change gives us access to much more memory, basically allowing us to do more in the game. WIP – Tech – Ability Builder and System Improvements: Rob and Caleb made a bunch of progress this week with the first pass of ability prediction, ability data management, and second pass ability dev UI for testing. All of this supports faster and more robust ability development. 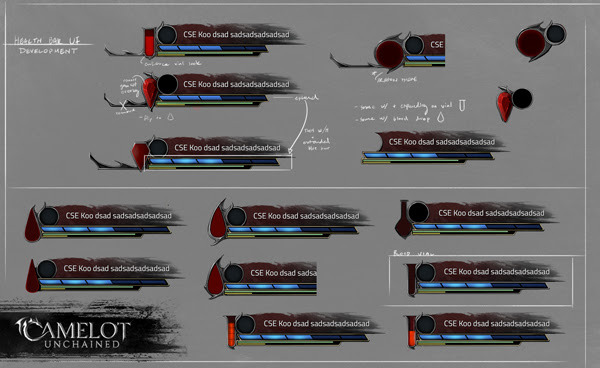 Design/Art – WIP – Simplified Health Bar Prototype: Based off some great discussion in our Forums, we’ve prototyped a different unit frame with one health bar instead of six. Players will still be able to target different body parts, but will draw from just one health pool. Check the thread on the forums for more info. Art – WIP – Weapon VFX Support: This week, Mike began reviewing the weapons we’ve previously created to come up with a list of needs to better support VFX on weapons. Our end goal is to not only visually display VFX on the weapons better, but to also speed up the required work. Design – WIP – Devout and Support Class Designs: Ben continued work on the devout classes’ skill part design, and has moved on to the support classes. This work will dovetail into the improvements in the ability system, allowing Ben to do more ability design work at a faster pace. Tech – WIP – “Smaller Particles:” Wylie has been plugging away at a fairly large task that reduces the memory cost of particles. This will improve performance in particularly high particle count situations–like the large scale battles that CU will be known for! WIP – Art – Characters 2.0: UV, Geo, and Proportion Improvements. 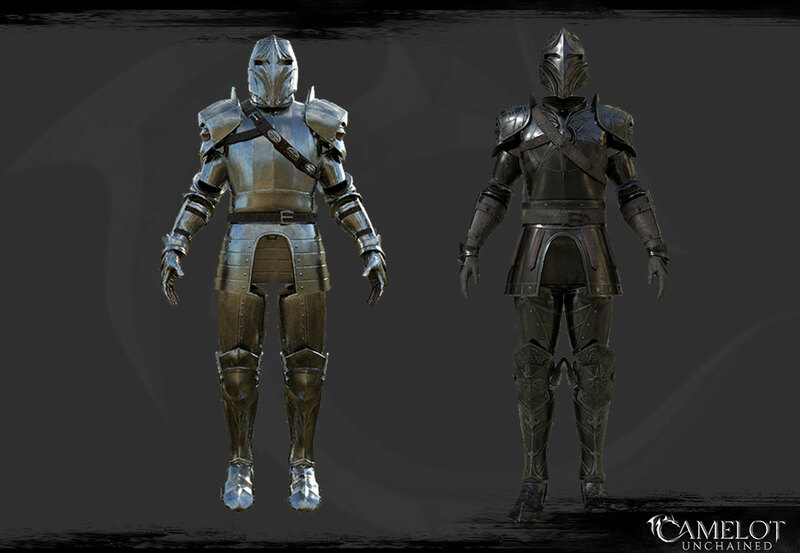 Updated Armor: Jon completed the Arthurian Heavy retrofit, including updated materials. He’s begun work on the TDD light armor. Once these are all complete and the necessary tech is done, we can get them in game. 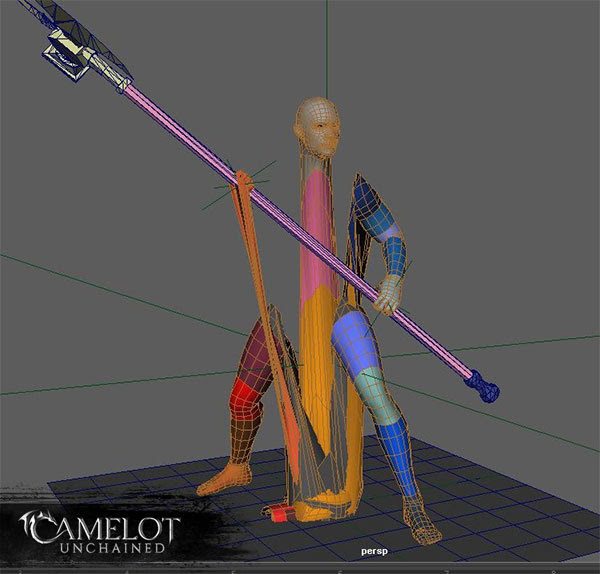 Artist Created Character LODs: Joe quickly weighted the test asset we created last week to make sure our non-procedural version worked and wouldn’t take much time to do. The next step is the required tech, as well as the rest of the models. Once complete, we’re looking forward to improved performance and better-looking models at a distance. M/F Human UV Edits: Jon spotted and fixed an issue with our layouts that would have caused more work down the line with more races. He made sure both male and female UVs matched up better, so we don’t have to make different textures for the same equipment pieces. 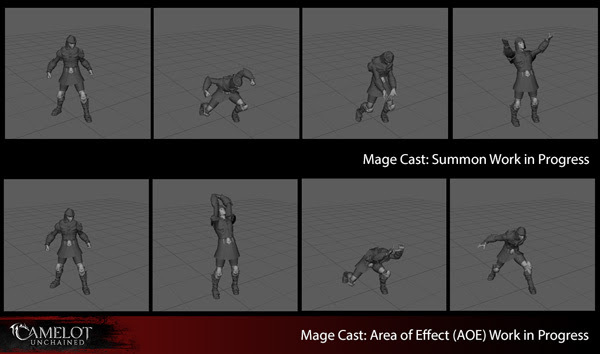 WIP – Shared Casting Animations: After review, Scott is updating last week’s mage casting animations with a couple of changes, as well as a bit of polish. Once he’s done with the base casts, he’ll begin work on the focus and wand permutations. These shared animations will allow us to test mages sooner, and give us some feedback on what additional animations we may want to do in the future to differentiate the classes. WIP – Short and Long Bow: Sandra began work on the new versions of these animations that will also support variable timing. Our new animations all use the improved character art and rigging, making it easier to complete the animations and make them look better. WIP – Tech – Improved Clouds and Disc Lights: Dave has a two-for-one this week! He’s greatly improved the look of our clouds, softening them and giving them more volume. Directional disc lights will improve the look of water and armor speculars, improving the lighting in the game. Tech – BC7 Texture Conversion: Smoother textures with less artifacting…yes please! This update is complete, plus we fixed a build bug that caused the temporary loss of our Alpha channels. Some of you may have seen our leafless trees this week! Yup, that’s fixed. 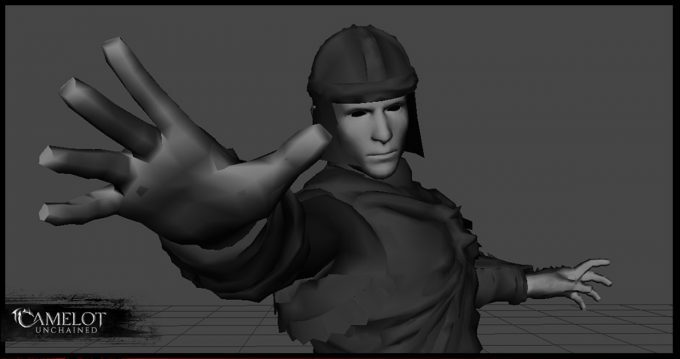 For art this week, we start off with an image of one of the casting animations Scott has been working on. As stated above, we’re beginning with a few shared animations covering various types of spells, such as projectile, summon, and AoE. To make it clear what the casters are doing, Ben and I (Tyler) came up with some regions around the character where the animations take place, such as above the head, to left or right side, or front and center. 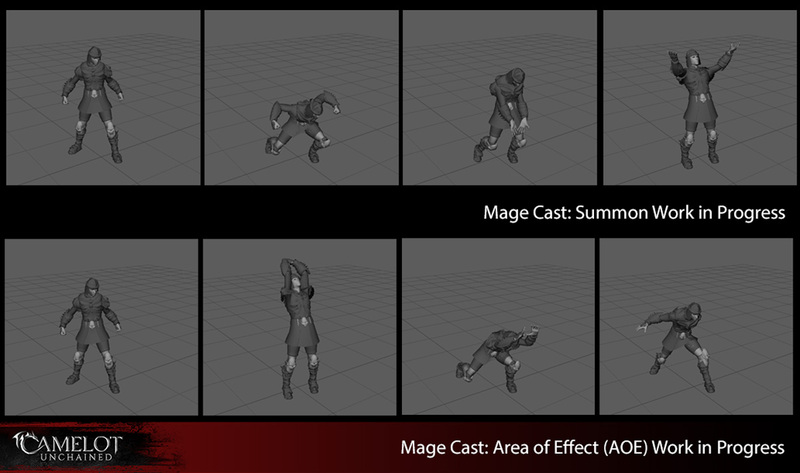 Once we have lots of testing on the mage abilities, we’ll look at adding in more unique animations to differentiate the classes and maybe add more flair to specific abilities. Scott added this extra dramatic shot of one of the poses he’s working on. Next, we have a WIP shot of the “before” (left) and “after” (right) Arthurian heavy armor from Jon. As you can see, our character’s proportions are much improved, allowing for a stronger silhouette. Our previous version has more of a capsule body, with little variation from shoulder to waist and hips. The characters were also a bit bulkier, which gave them a weaker silhouette. The new version also uses less polys, improving performance. We’re still working on these guys, so expect them to continue changing. Jon also gave the new version a fresh coat of paint with much more detail, which, thanks to our UV/Texture changes, will be better retained in-game. Here’s a sneak peek into all the work that goes into concepting our UI. Michelle created a whole bunch of different approaches to the simplified health bar. If you missed this month’s newsletter, you can find it HERE. 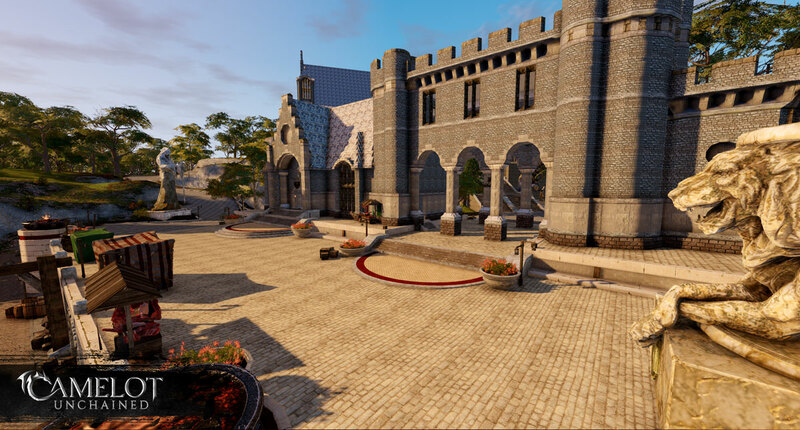 Lots of great stuff in there, including a bunch of new images of the amazing buildings our Builders’ Brigade made in C.U.B.E.. Here’s a couple of my favorites. To finish up, we have this great little accident that was posted in our animation Discord channel. I think something went wrong? And that’s it for this week’s update. We’ve got several big features still in the oven that will really improve the game moving forward. Once this work is in, we’ll get into some serious testing to smooth out all the bugs inherent in such big changes. I’m particularly excited for the 64bit client, which will allow me to put some more art into the game. Moving forward, the switch to Coherent will also allow us to do more cool things with our UI. That doesn’t even touch on the updated characters and animations further down the pipe! Lots of cool things we’re excited to share with you all! We’ll CU next week!